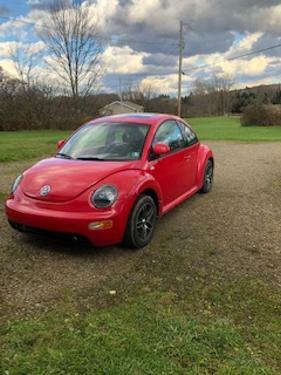 For Sale: 2000 VW Beetle 1.8 Turbo, 5 speed 116,000 miles or so. Replaced this year headlights, taillights, front struts both side, rear shocks, wheels, tires,rear brake pads and rotors, driver side axle, think I'm missing something else. Inspection until May 2019. few issues nothing major. Does have an R-title hit a deer once. $1700.00 obo is my asking price. Car is in storage but easy to get too. original wheels come with and spare that's just like the after market wheels on it. email thru this site.